A Robert Plant concert sends you on a journey. On September 23, his concert at Northerly Island took me to the mountains of Appalachia, the plains of the Mississippi Delta, and the west coast of Africa. Great artists always challenge you to leave your comfort zone and follow them, even if the audience is not along for the ride. The spiritual and the carnal are two sides of the same coin. Plant sang with the same passion and bite on sexually charged standards like “Black Dog” as he did on “Satan Your Kingdom Must Come Down,” a traditional song from the Carolinas that Plant reinterpreted on his album Band of Joy. Through his sensual body English and growling voice, he made no distinctions between the lustful narrator of “Black Dog” who vows to make a woman sweat and the defiant preacher who spits at Satan. During “Satan Your Kingdom Must Come Down,” he segued into “In My Time of Dying,” another traditional song that Led Zeppelin famously adapted on Physical Graffiti. One moment, Plant was wailing, “I heard the voice of Jesus say Satan, your kingdom must come down,” and then suddenly he was singing, “Meet me, Jesus, meet me. Meet me in the middle of the air/If my wings should fail me, Lord. Please meet me with another pair” from “In My Time of Dying.” Robert Plant, at age 67, is undoubtedly aware of his mortality. But he recorded “In My Time of Dying” when he was 26. Hearing the two songs together made me think of Plant in a new light: a man on a spiritual journey. “Stairway to Heaven” isn’t just an epic song but a signpost on the road. Plant is to rock what Al Green is to soul: he comfortably embraces the sensual world while he reaches for something deeper and otherworldly. I am eager to re-listen to his musical catalog in this new context. Bukka White was a badass. I have a fairly decent understanding of most of the blues greats, but Robert Plant reminded me of how little I really know when he called on the ghost of Bukka White during the concert. If you’re a Led Zeppelin fan, you have heard Bukka White even if you don’t know it. White was one of those old-time blues guitarists who lived in the Mississippi Delta, and his recording of “Fixin’ to Die Blues” was covered by Bob Dylan in the early 1960s. Led Zeppelin referred to his song “Shake ‘Em on Down” in “Hats Off to (Roy) Harper” and “Custard Pie.” Plant recorded a version of “Fixin’ to Die Blues” on his 2002 album Dreamland, and he showcased the sad, mournful power of the song during his concert at Northerly Island. For many Chicagoans, the blues begins and ends with Muddy Waters and Buddy Guy, but Robert Plant reminded us that the Mississippi Delta produced a mother lode of influential musicians who sang of hard times and impending death, which was always around the corner for them. Amid his onstage patter, Plant name-checked Bukka White as he paid tribute to the blues giants who shaped his own career. Then Plant stopped talking and let his singing tell the story as he whispered the lyrics, “Feelin funny in my mind lord I believe I’m fixin to die,” and channeled the sense of mortality and spiritual longing that White introduced in 1940. Plant mentioned long-forgotten artists such as Bukka White and the Stanley Brothers of Appalachia, laughingly comparing their popularity to that of Journey while making it clear he worships the ground the old guard walked on. 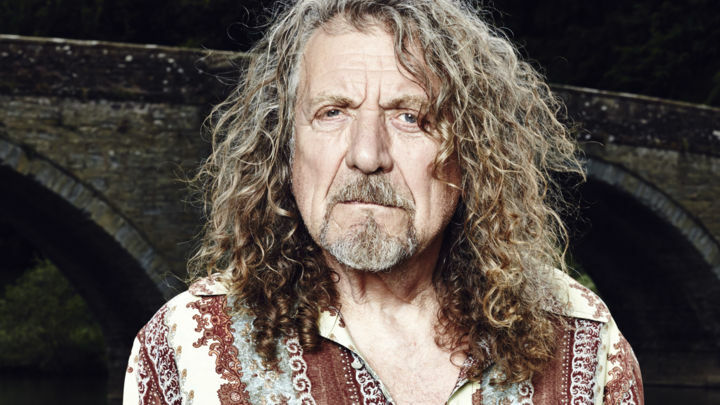 The golden god of the 1970s has become a golden shaman, dancing on a stage as he extends his hands and invites you to experience what Plant described as a “benediction of spirit and soul.” If you are willing to join him, Robert Plant enriches your life long after he is done singing. This entry was posted in Music and tagged Bukka White, David Deal, Juldeh Camara, Led Zeppelin, Northerly Island, ritti, Robert Plant, Superhype. Bookmark the permalink.